Well, it didnt seem likely that I would have a sit down lunch this week. Being presentation week, it should go without saying that all meals should be eaten at your desk. But while walking to Gourmet Garage in Soho for soup and sandwich, I happened to bump into a friend and ended up having a lovely Mediterranean lunch at Antique Garage just a block away. 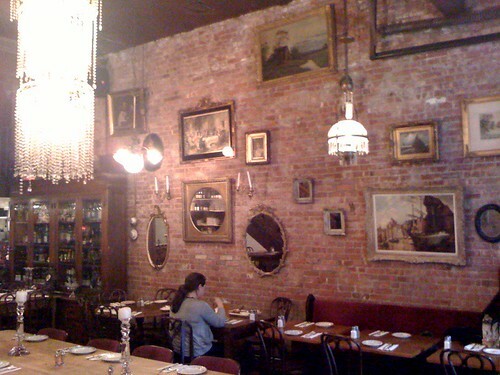 The space is quite charming and its name, Antique Garage, is befitting since its decorated with all sorts of antiques (mirrors, chandeliers, and paintings) and the wall facing the street opens up like a garage when the weather is nice. Ta-da! Since it was our first time there, we shared the platter that included an abundant samplings of shepherd salad, hummus (better than Zaytoons), tzatziki, eggplant salad (favorite--chargrilled and smoky! 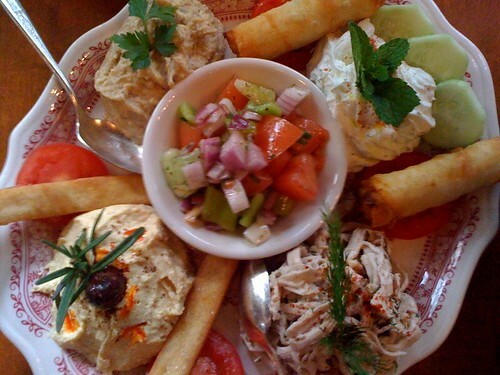 ), circassian chicken and borek (the spring roll lookalike with feta cheese and parsley--my second favorite). 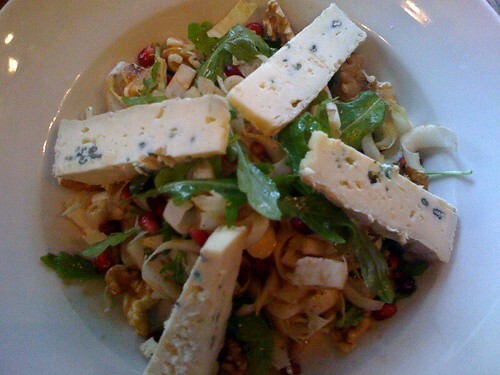 And we also shared a large frisee and arugula salad with walnuts, pomegranate seeds, blue cheese and champagne dressing. Very good. My one gripe is...that for lunch, damn that meal was expensive! $30 in change.